• A 120-foot-tall tower on town-owned land in Lookout Mountain, Tenn.
• Cell phone providers can build their own towers or rent space on a tower owned by a cell phone tower company. • The more cell phone providers that rent space on a tower, the more profitable that tower becomes. • When mobile phones first came on the scene, the tower networks' goal was to provide coverage so calls wouldn't be dropped along highways and major roads. • Today, more towers are being built near residential areas. A cell phone tower in Chattanooga. Americans are head over heels in love with smart phones, a mere seven years after Apple introduced its iPhone to the masses. Two-thirds of U.S. consumers now own a smart phone. Their growing demand for data-gobbling uses such as video means users are on track to pass the $100 billion mark this year on data-plan spending, experts say, and U.S. demand for mobile data is expected to grow eight-fold by 2018. This "mobile data boom" helps explain why new cell phone towers are proposed around the Chattanooga region, from the top of Lookout Mountain to Finley Stadium, home field for the University of Tennessee at Chattanooga football team. As with any boom, there's money to be had. U.S. lease holders may get as much as $8.5 billion annually, based on figures from statisticbrain.com. The website says the nation has 190,000 cell phone towers with an average yearly lease rate of $45,000. But one expert says most lease holders don't get nearly enough rent, based on industry figures that show a single tower can have a gross profit margin of close to 80 percent. Finley Stadium was offered either $853 a month or a 3 percent commission to allow a 150-foot-high cell tower disguised as a flag pole with a 20-by-30-foot American flag on stadium land near Main Street. "We need the revenue," said Paul Smith, who took over in December as executive director of the 20,668-seat venue. "Finley Stadium, it's never truly made money." Smith said he's gotten lots of advice - solicited and unsolicited - about how to negotiate the lease. He's leaning against the flag pole design, since he's heard it won't accommodate AT&T's larger, newer antennas - which could hurt the stadium's revenue stream. Smith plans to negotiate the best lease payment he can, and he's leaning toward an antenna disguised as a marquee-style sign. "I'm not going to put one of those stupid-looking trees on our lot," he said, referring to a cell tower disguised as a pine. Tennessee has 2,836 cell phone towers, with applications for 27 new towers, said Gary Harris, assistant director for the Tennessee Office of State Assessed Properties. It might seem like winning the lottery to have your property picked as a cell phone tower site. But 90 to 95 percent of the time, individuals and municipalities don't ask for enough compensation, said Hugh Odom, a Nashville attorney who spent a decade working for AT&T and now helps people around the country negotiate cell tower leases through his business, Vertical Consultants. "That's where people miss the boat. They don't even miss the boat - they miss the ocean." Odom said. "You feel like you're getting something, but you're really not getting much at all." Odom said that, on average, his customers get a 236 percent increase in their lease payment after the engineers and other experts at his business figure out what a cell phone tower site is truly worth. To support his argument that cell phone tower companies don't pay enough for leases, Odom cites what he said are big profit margins at two industry leaders, Crown Castle International Corp. and American Tower Corp., both of which are traded on the New York Stock Exchange. 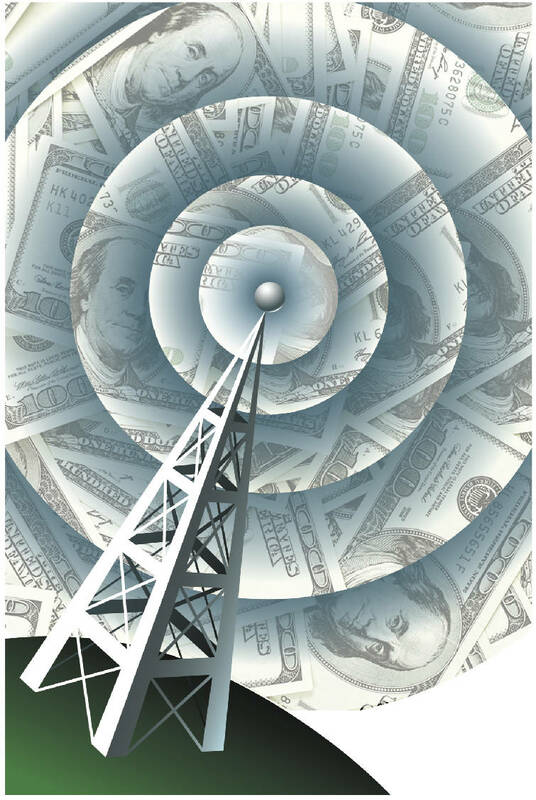 In a publication for investors, American Tower explains that a cell tower with three wireless companies as tenants can have $60,000 in annual revenue against $14,000 in expenses, for a gross profit margin of $46,000, or 77 percent. "Their profit margins are not only large, they're increasing," Odom said. "It's because they're making really good deals for themselves." American Tower's Boston-based spokesman Matt Peterson declined to comment. Lookout Mountain, Tenn.'s town government was offered $1,500 a month, initially, if it allows a company to build a tower on town-owned property. That income would increase as additional companies rented tower space. "It's a little bit of money - but it's not about the money," town consultant Dwight Montague said, explaining the town has an annual budget of $3 million. Though he added, "Any income that we can get from an alternate source keeps us from having to raise property taxes." Negotiating a lease payment is a ways off, he said, since Lookout Mountain needs to decide such things as whether to let AT&T or Wireless Properties build the tower and what it should look like. Towers disguised as a giant flag pole or pine tree have been proposed. Lookout Mountain hired Nashville-based consultant Jim Murphy to help it navigate the cell phone tower process. "Can you negotiate with the cell tower companies? Can you get a lot more money than they offer? It depends on what they offer," Murphy said. Murphy said increased demand means companies are building more towers and improving antennas on existing towers. When mobile phones first came on the scene, the tower networks' goal was to provide coverage so calls wouldn't be dropped along highways and major roads. Now, towers are being built near residential areas. "That doesn't work anymore when people want to use these things 24/7," he said. "If you know people under 30, they probably don't even have a land line and they use their mobile phone for everything." While some people have raised concerns about radio waves emitted by cell towers, state and federal guidelines prevent communities from banning the structures, Murphy said. The Unitarian Universalist Church of Chattanooga has had a cell tower disguised as a church tower for nearly 20 years on its property near Interstate 24. "That has been quite lucrative for us," said David Reed, a member who's on the church's finance committee. "We've been pretty pleased with the deal we've had with AT&T and Verizon." Contact staff writer Tim Omarzu at tomarzu@timesfreepress.com or twitter.com/TimOmarzu or 423-757-6651.